My name is Arabinda. 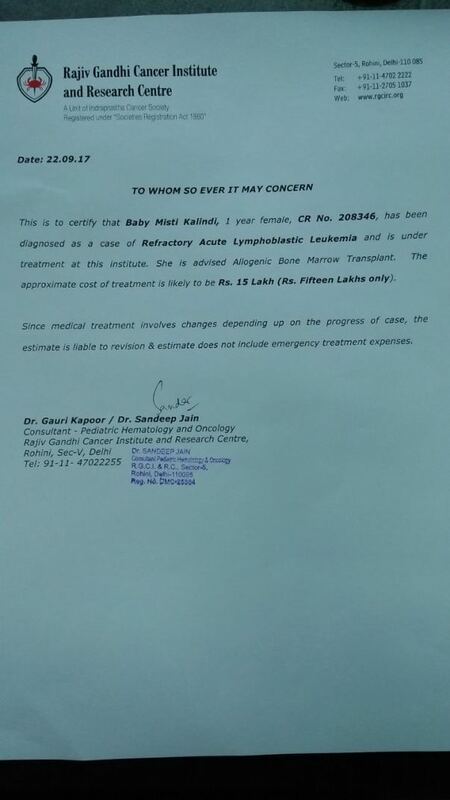 This is a humble appeal to raise funds for my niece who is suffering from “Acute Lymphoblastic Leukemia (Blood Cancer)”. Till her 4th month she was completely fine. 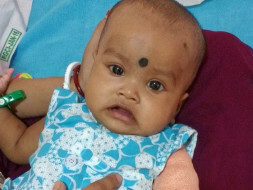 But from 5th month she started having frequent fever, cold, cough and swollen forehead. My Brother and sister-in-law showed her to local doctors multiple times but there is no luck. Finally they admitted her to the hospital where she was diagnosed for very high WBC Count, low RBC and platelets. Local doctors treated her temporarily and referred her to Rajiv Gandhi Cancer hospital, New Delhi where she diagnosed with Blood Cancer. and after that she needs to visit hospital once in 3 months. 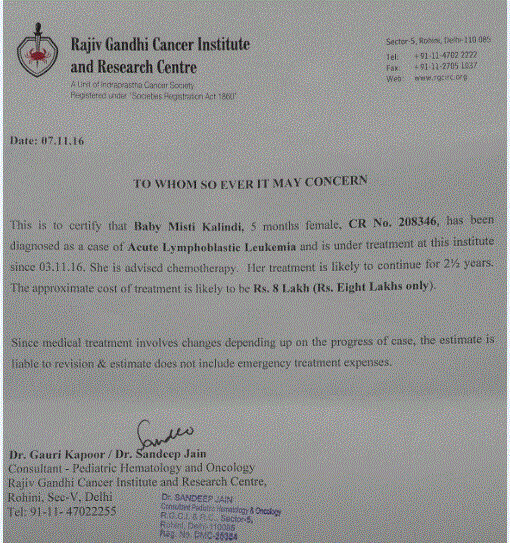 As per doctors, cost of the treatment will be Rupees 8 lakh (INR 8, 00,000). As my brother is unemployed, I have been bearing the expenses of treatment so far. But now we are running short of funds. So, I would appeal you to kindly contribute so that baby’s treatment will go smoothly. Your timely contribution will save the life a child who is suffering with Blood Cancer. I am indebted to you for all your support so far. For last 10 months, the little child Misti has gone through so much pain due to hard chemotherapy, injections, tests which I cannot describe. But she faced all the challenges like a warrior without being aware what is going on with her. Three months back when doctors told us to take Misti home as she did not respond to the normal chemo cycles, we were in tears. After enquiring from the doctors if there is any other possible treatment, we got to know about the Blincyto injection, but the cost was out of our reach. But we got all your support, and today by God's grace and your kind prayers Misti has reached the remission stage, and now she has a chance to be fully cured after bone marrow transplant. Doctors will be performing BMT within 10 days. Since we did not get a 100% match from outside, so my brother (Misti's father) would be the donor. He is 50% match, hence there would be some complications but we are hopeful that by God's grace and your kind prayers, Misti would get fully cured and live her life happily. The cost of BMT is Rs. 1500000 as per the latest estimate provided by the hospital (estimate attached below). This is a final appeal to all of you to please help us raise this amount, your timely contribution would save Misti's life. Please do share this campaign with your friends and request them to share in turn. And kindly keep Misti in your prayers. Thank you all once again for your timely contributions. 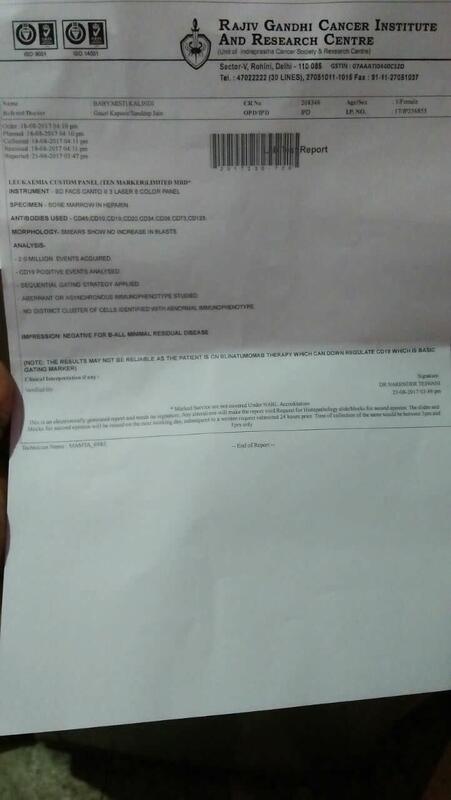 I feel happy to share with you that by God's grace and your kind prayers, after the use of the Blincyto medicine for last 7 weeks, Misti is in complete remission stage now (report attached), she does not have any blast in the bone marrow. However, still, she is under the medication as 8 weeks of course, needs to be completed. Doctors have suggested that they want to perform the bone marrow transplant within 20 days from now. They have made a request for getting a match from the donors' registry. In case they find a near about 100% match, they would prefer to go with it. And if they do not get a suitable match, they would go with the transplant with parent's bone marrow which would be 50% match and involves risk. 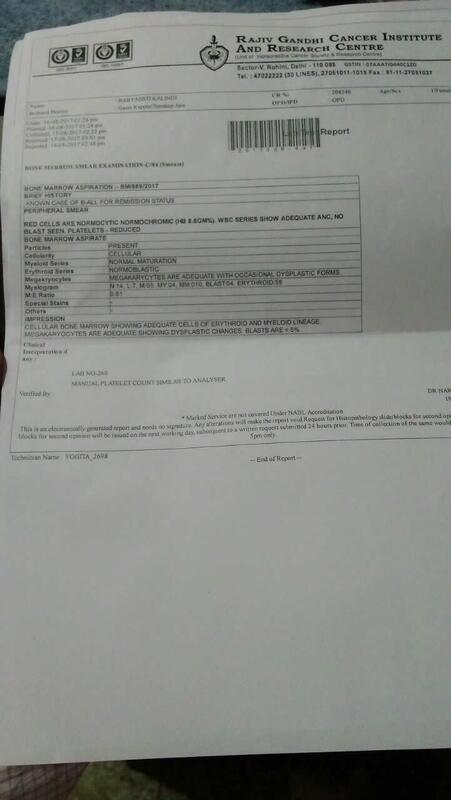 We could somehow manage to get the Blincyto medicine because of your timely contributions, some help from my friends and relatives and my family savings. We have also received PM Relief fund which is being used for paying hospital bills for last 2 months and about to exhaust. Getting a match costs from 7 to 35 lacs depending on from which country we get it. And the cost of the transplant is 10 to 12 lacs. The final estimate will be shared by the doctor within a week. With all the funds getting exhausted, I have no way other than appealing humbly to all of you again to help us meet this huge expense for Misti's final treatment. Kindly share this campaign with your friends and please keep Misti is your prayers. Note: In case you come across someone who is relapsed case like Misti and require any information regarding the Blincyto medicine, please feel free to email me, I would be really happy to help. Please accept my sincere gratitude for all your support so far. By God's grace and all your prayers, the first cycle of medication has worked. The bone marrow test results shows that the blast has reduced below 5% which is a good sign as per the doctor. However they would like to continue with the medication for 2nd cycle (i.e another 28 days) as well for further improvement before they do bone marrow transplantation. Since the doses for the medicine were reduced for Misti as per her weight in the 1st cycle, so left over medicines can be used for the 1st half of the 2nd cycle. We need to get the medicine for the 2nd half as soon as possible. So, I request you to please contribute and share this campaign with your friends and family. Thank you once again for the support. Please do pray for her health.